The small group you have been longing for actually started in 1742. It wasn’t strategically designed to appeal to the fact that you like dogs rather than cats, it wasn’t something that had hours of homework each week, and you definitely didn’t spend 30 minutes watching a mega-church pastor on a T.V.. This small group was about transformation through community, and it was called (back in the day) a class meeting. I cannot tell you how I have hungered for a tool that helped contextualize this brilliantly formative practice in the 21st century. I mean, How hard could that be? The 1700s weren’t that different from today. Wait, that world was a VERY different place. Forget whether or not they had internet or TV. There was no refrigeration, telephones, or light bulbs! Taking a practice from that time and translating it to today takes an incredibly intelligent and culturally-aware individual. Praise God for Kevin Watson. In his forthcoming book (11/15/2013) The Class Meeting. He does just that. He not only gives an accessible introduction to the story of the Class meeting, but he helps the reader place it in the modern context and envision exactly what it would look like in a suburban den or high-rise apartment. That alone is worth the cost of the book, but The Class Meeting goes further by seamlessly merging re-imagined history, small group curriculum and a ministry guide into a single new category. The book is not merely about class meetings; it is designed as a launching resource for these types of small groups. That’s right. You put this in the hands of small group members and as they go through the book together they begin practicing a modern version of Wesley’s class meetings! 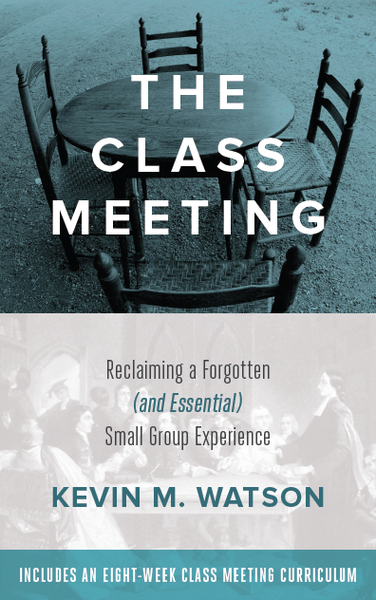 How appropriate that the first credible book I’ve read about brining the class meeting to today ends up being as practical and innovative as Wesley’s original class meetings were. If you have seen how quickly people hit the transformation ceiling of curriculum-driven small groups, if you have watched as affinity groups devolve into gossip groups, cliques, or into extinction, if you have seen the brokenness of the Sunday School model and the oft-hyped and oft-failed modern small group craze, this book is for you. For those of you involved in Youth Ministry, this book will offer a model for groups that is more than accountability and more than Bible study. It will help you tap into the desire of teens to be heard and understood as well as their need for guidance and partnership. Though it will require some teenization, it will be well worth it! If you haven’t already left to purchase it, what are you waiting for? Go get it now!